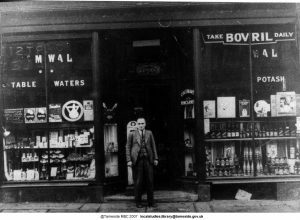 Ashton under Lyne has many famous people in its long history, seeing events that are part of the fabric of the industrial north. The Chartists came and went, murdering a police officer here in the town, some paying for their crime and others not. About the same period as this in Bolton Lancashire a baby was born, Mary Ann Hague born 1847. Who could have ever known that this child of Bolton would turn into one of Ashton’s most infamous residents; reportedly killing her own daughter in cold blood. Mary Ann Hague would become later in her life a convicted killer and Ashton under Lyne’s first and only serial murderer. If there are any more serial killers in the history of this historic town, I am not presently aware for them. It appears that Mary Ann married at the age of 19 years to Thomas Britland and man of 24 years. The marriage produced two daughters Elizabeth and Susannah Britland and at some point, in their history they became residents of Ashton under Lyne. Mary Ann Britland by 1886 was allegedly involved in an extra marital relationship with one Thomas Dixon who was also married. His possible act of betrayal though would have dreadful consequences on his life later in this story. 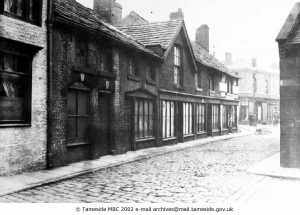 The Britland family moved to live on Turner Lane Ashton under Lyne in 1885, with Susannah Britland going into service in Oldham. The rest of her family took up residents in a rented house, 133 Tuner Lane and to Mary Ann’s horror it was infested by mice. 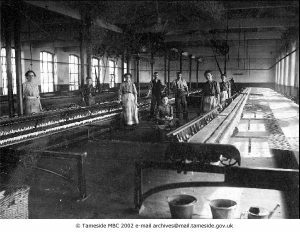 Mary Ann and Elizabeth both worked at Fisher & Jackson Lees Street Mill Ashton under Lyne. 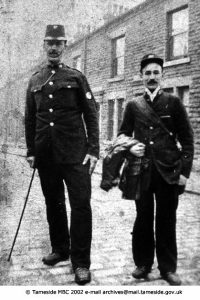 Her husband Thomas was a Cart Driver and worked as a barman in the Heaps Vaults Old St Ashton under Lyne. For the curious amongst you, this Ashton drinking establishment was opened by the Heap family in 1808 on Old St Ashton under Lyne. The building Thomas worked in is still located adjacent to the Shubar on Old Street; sometimes history is right under your nose. Now our story of Mary Ann Britland takes a turn for the worst, her possible extra marital activity with Thomas Dixon was discovered by her daughter Elizabeth. Unfortunately for Elizabeth she became ill 8th March 1886 with convulsions and vomiting reported to the Doctor. Elizabeth died two days later on the 10th March 1886 with the death certificate being issued by a Doctor Thompson reporting the cause of death as convulsions, vomiting and spasms of the heart. What is probably most gruesome about the death of Elizabeth is the fact that her mother tended her for the whole two days she was sick. Despite the fact that later Mary Ann is arrested for her murder, it was noticed at the time but not by the Doctor. That Elizabeth’s hands were tightly clenched on her death and this was only seen; because traditionally another member of the community lays out the body of the deceased. In this case it was a middle aged woman by the name of Sarah Lloyd who would play a role in the murder conviction of Mary Ann later on. Following this Mary Ann collected the £10 insurance policy that had been taken out in the event of her Daughter’s death. These policies were taken out the pay for funeral costs, which at the time for a modest funeral would have been about £6 and probably a few shillings. In modern terms that £10 policy would only be worth around £1300 in 2018, which would not even cover the cost of a funeral now. A little over seven weeks later Mary Ann purchase from Kilvingtons the Chemist a packet of Hunters Infallible Vermin and Insect Destroyer. A poison used to kill mice infestations in the home; but if we are to believe that Mary Ann Britland was in fact a cold blooded murderer. Her supposed purpose for this poison was to kill her husband Thomas Britland to remove another obstacle preventing her from a life with her alleged lover Thomas Dixon. It is reported that on the 30th April 1886 that Thomas Britland became violently ill in their home; after eating a meal with his wife. How vile would a person have to be as to sit there and watch your spouse ingest the poison as you ate with him. But it is what Mary Ann apparently did and Thomas suffered for four days after this. Not dying until the 3rd May 1886 and visited by another local Doctor he was pronounced dead, with the cause on his death certificate being epilepsy. We have to assume that Mary Ann used a different Doctor, so she would not raise suspicion for two such similar deaths in her home. Her friend Mary Dixon came to her side to comfort Mary Ann on the tragedy of losing; a daughter and her husband in such a short space of time. Sadly for Mary Dixon we can only assume she was not aware of her own husband’s alleged betrayal with Mary Ann. As her kindness and close proximity to Mary Ann Britland may have later cost her, her life. Following the death of Thomas Britland Mary Ann spent a great deal of time with the Dixon family who were also residents of Turner Lane. This must have been a particularly uncomfortable period for Thomas Dixon; with his wife and his alleged lover eating at his table. Sadly for Mary Dixon it was at this table she became fatally ill, for on the 13th May 1886. Mary like Thomas and Elizabeth Britland became violently ill, collapsing in spasms and dying in the early hours of the following day. Doctor Thompson again attended, at the awful ending to the life of Mary Dixon, her husband reportedly distraught on the death of his wife. As with the previous two deaths, the body of Mary Dixon was laid out by Sarah Lloyd and at once noted that the Hands of the deceased were clenched tightly. The same circumstances she had witnessed when attending the body of Elizabeth Britland. Whether Sarah reported her suspicions or the fact that a Post-Mortem was carried out on Mary Dixon at the request of Doctor Thompson. But this death was treated with suspicion and after she had asked some odd questions of the funeral caterer John Law. Mary Ann Britland then was interviewed by the Ashton under Lyne constabulary and arrested on suspicion of murder. Initially Thomas Dixon was also suspected of being involved but this was later dismissed, and he was released. The Post-Mortem on Mary Dixon found traces of arsenic and strychnine in her stomach and it was later found out. That Mary Ann had also purchased Harrisons Vermin Killer prior to the death of Mary Dixon and her Husband Thomas. With this overwhelming evidence Mary Ann Britland was charged with murder and the local community were shocked to the core at such events. Although Thomas Dixon was admonished of any involvement in his wife’s death; you can be certain that his possible involvement was the talk of Ashton under Lyne. Once Mary Ann Britland was arrested, the case against her began to take shape. Autopsies were performed on the bodies of Thomas and Elizabeth Britland and although no strychnine was found; there were traces of Arsenic found in both of the alleged victims. With a powerful case against her Mary Ann Britland was brought before Justice Cave at the Manchester Assizes Court. Acting for the Defence was a Mr Blair and for the prosecution a Mr Addison, with the expert witness being a Doctor Harris; who confirmed the presence of Arsenic in the bodies of two of the victims. The only flaw here is the fact that arsenic was ever present in the 19th century. In even the most common items such as wallpaper and dyes for clothing; plus many industrial processes they would have been exposed to. So although the evidence pointed to Mary Ann being a prolific poisoner, because any strychnine would have disappeared from the bodies the proof wasn’t absolute. This doubt though must have played on the minds of the Jurors in this case as the first time they were to deliberate over a verdict. They returned to the courtroom without a verdict, doubt would have been reinforced by the certainty that if they convicted Mary Ann. She would certainly be sentenced to hang for her crimes, something maybe they would not want on their collective conscience. When they returned to the courtroom without a verdict they were sent to deliberate further over the evidence. At some stage during these proceedings the Jury were informed that a motive was not required to convict Mary Ann of these killings, which would be unthinkable in the present. By 10:00pm on the day of the trial the Jury had still not managed to agree a verdict; and it is said that after further direction from Justice Cave they returned a guilty verdict. Once the word guilty had been read out in the court in Manchester, Justice Cave sentenced Mary Ann Britland to death. At this point Mary Ann still protested her innocence to the court and continued to do so, as she was led away to her condemned cell. Whether Mary Ann was innocent or guilty, she must have been terrified at this point. During this time she was visited by her Mother Hannah Hague and her Daughter Susannah Britland. This visit would have occurred sometime after the trial on the 22nd July and before she was executed 9th August 1886. It is said that during this visit, Mary Ann allegedly confessed to her crimes in front of her Mother and Daughter. Yet another traumatic event in the life of the teenage Susannah; and dreadful for Mary Ann’s Mother to hear that the child she bore had committed such hideous crimes. You can only imagine the horror they would have felt on leaving Mary that day. Especially for Susannah on the realisation that she had lost her father and sister in such a way. On Monday 9th August a distraught and terrified Mary Ann Britland was led from her condemned cell by two female warders. So awful was her state of mind, she had to be supported for the entire journey to the Strangeways execution shed. Before Mary was taken to the gallows, two male warders half lifted half carried Mary to the trap door. A noose was placed around Mary Ann Britland’s and her last words, heard by only a few people were “oh lord save me and have mercy upon me”. At this point one James Berry operated the lever that opened the trap door of the gallows. Mary Ann Britland’s body fell seven feet, the noose broke her neck and killed her immediately. Mary Ann became the first woman to be hung at Strangeways Prison and is one of only four women executed there. That final second of her life must have been the most terrifying she had ever experienced, it does not mention whether Mary Ann was blindfolded or not. But even if she had been, that moment before death must have served as a terrible punishment for her crimes. Whether Mary Ann Britland did murder three people cannot not be accepted as certain, the confession of a women in her condemned cell is only hear say. The poisons that killed the three people were present in many forms, strychnine was often prescribed as medication at this time. Arsenic appeared in so many industrial process and even fabric dyes that its presence could not prove murder; and although it is claimed that Mary Ann was having an affair with Thomas Dixon, this was never proven. If an affair with Thomas Dixon had been proved, then it is certain that he too would have faced trial for the deaths of his friends and spouse. The Judge in the case dismissing motive of being required to convict, may have been responsible for a miscarriage of justice. I can see no possible way of ever resolving the issues of this long past event; and Mary Ann Britland will remain Ashton under Lynes’s only ever serial killer. The cramped terraces of Ashton under Lyne no longer exist as the slums they were in this period. Poor sanitation and terrible working conditions were responsible for the deaths of many of the poor. The story of Mary Ann Britland is both tragic and fascinating and part of the fabric of history in Ashton under Lyne. The ghosts of the past still walk Turner Lane and next time you pass by, think of the horror that occurred here. 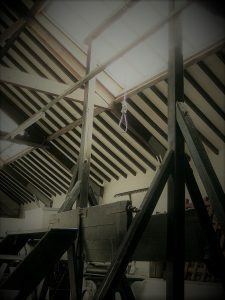 Gruesome death at the hands of a very ill woman or did her final scream on the gallows end a tragedy; we will truly never know. If you would like to know how this account was put together, please contact our sales team and they will pass your details on to the authur. This entry was written by Stetat, posted on December 7, 2018 at 9:05 am, filed under Ashton under Lyne, Uncategorized. Bookmark the permalink. Follow any comments here with the RSS feed for this post. Post a comment or leave a trackback: Trackback URL. Besseges (Valves, Tubes & Fittings) Limited, Jackson House, Turner Lane, Ashton-under-Lyne, Lancashire. OL6 8LP.